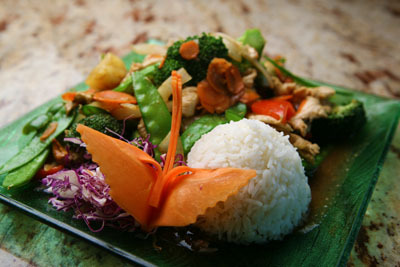 You can choose from the following and it will be quickly sauteed with your choice of any of our Wok dishes. Fresh napa cabbage, crisp snow peas, carrots, broccoli, bean sprouts, straw mushrooms and tender young corn in a savory mild sauce. An authentic flavorful sauce of mild chilies simmered with minced mild yellow onions, minced sweet bell peppers, pickled garlic and lemongrass with a hint of sweetness. Asparagus, broccoli and snowpeas with a touch of garlic. 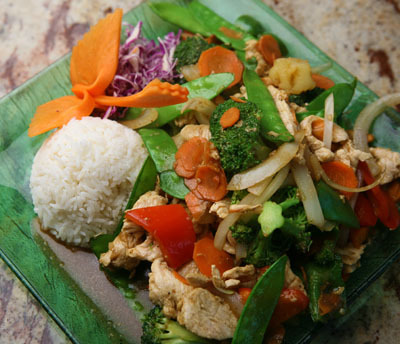 Your choice of meats or seafood stir-fried with teriyaki sauce, green onions and sweet bell peppers.